In 1920 Thomas J. Healy had big plans. The Irishman had come to New York in 1886 at the age of 15 and by the time the First World War had ended, he owned five restaurants and catering establishments, some in the Broadway theatre district like the 1000-seat Golden Glade. Healy let it be known that he wanted to build a sixteen-story hotel on the irregular plot of land he acquired from the Eugene Higgins Estate in a 200-year lease. He put off the hotel project, however, and instead contracted architects King and Campbell to design an enchanting enclave of miniature English houses, stretching from 94th to 95th Streets between Broadway and West End Avenue. Using for their inspiration the play “Pomander Walk,” which opened on Broadway in 1910 and featured a tiny street in 18th Century London, the architects devised 20 two-story houses facing the 20-foot wide lane and seven facing 94th and 95th Streets. The diminutive homes were in the popular Tudor style with irregular rooflines and gables, half-timbering, brick and stucco. While they appeared to be individual houses from the outside, in fact each was a two-unit rental apartment building with separate apartments on either floor. The fairy-tale size required that the kitchenettes were tucked into a walk-in closet. 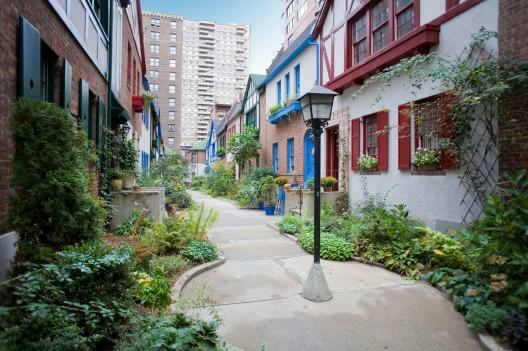 The sub-headline to the article called it a “Street of Little Houses, Lawns, Flowers and Fountains, in Shadow of Broadway.” Each house was estimated to cost $2,950. Healy, according to Random House's 1939 "New York City Guide," intended the Walk to be inhabited by theatrical people. Immediately upon completion it was home to the likes of Rosalind Russell, stage actress Elsie Barlett, composer Herbert Stothart at #7 and Mary Warnock, a Ziegfeld Follies chorus girl at #22. Film actors Lilian Gish, Madeline and Nancy Carroll lived here as did drama critic Ward Morehouse. If Thomas Healy did intend Pomander Walk to be a temporary project that would be razed for his once-anticipated hotel, his death in 1927 precluded those plans. In 2005 restoration architects Cutsogeorge Tooman & Allen Architects, P.C. were commissioned to rehabilitate the facades of the charming complex. 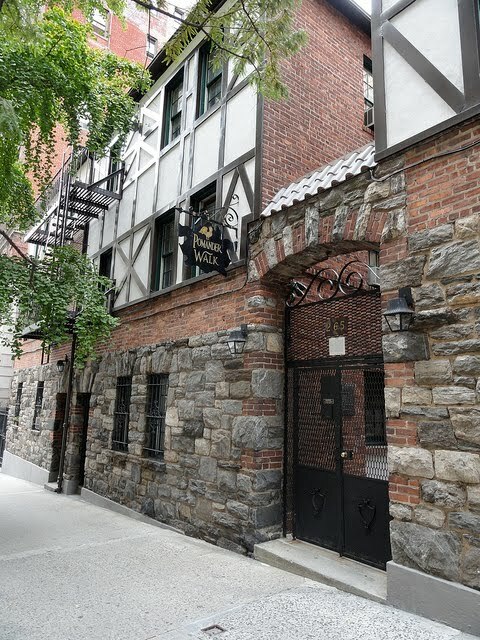 The firm executed a $650,000 masonry and stucco restoration and rebuilding, restored the wooden doors and windows, removal of façade coatings and repainting. Charm has its price. 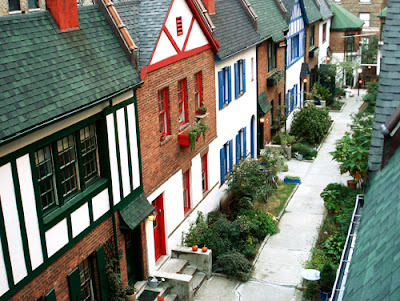 In 2005 a two-bedroom apartment sold for $610,000 and a few months later a similar one sold for $725,000. In 2009 a 1500 square foot apartment sold for $1.5 million. Pomander Walk, one of the most enchanting and delightful residential areas in Manhattan, was designated a New York City landmark in 1982. Tom, your blog - like New York City - never ceases to amaze me with the range and variety of available information on offer, the dark secrets revealed, and the many hidden corners and streets of this great metropolis waiting to be discovered and explored by all. 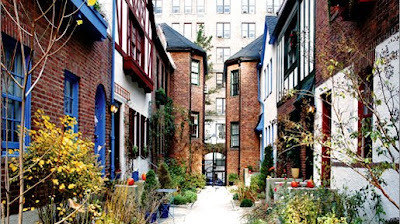 Pomander Walk is definitely on my list of places to visit on my next trip to New York. What an amazing collection of beautiful homes. I have walked along the nearby Hudson River Greenway, never knowing or suspecting that something like Pomander Walk even existed in New York City. Thanks for bringing this to my attention. Definitely on my list of places to see on my next visit to New York. a stone's throw from where we live...but everyone says it's always closed, and it's definitely gated. any info on open hours, at least during the christmas season?? ?